LONDON, England (CNN) -- A Dutch lawmaker who made a controversial film about Islam planned to travel to Britain on Thursday despite a ban on his entry. Dutch authorities filed charges against Wilders last month, accusing him of inciting racial hatred. Geert Wilders said he was invited to screen his film, "Fitna," at the House of Lords on Thursday evening, but was informed by the British ambassador to the Netherlands that he would be refused entry because the beliefs expressed in the film would threaten public security. Wilders said he still intends to fly to Britain in the hope that he will be let in. Britain's Home Office confirmed that Wilders had been denied entry. It said the move is permitted under European Union law, which allows states to refuse entry on the grounds of public policy, public security or public health. "The government opposes extremism in all its forms," said a Home Office spokesman, who would not be identified, in line with policy. "It will stop those who want to spread extremism, hatred and violent messages in our communities from coming to our country." "This is freedom of speech. I mean, let's have a debate," Wilders told the BBC. "This is how a democracy and the rule of law and a civil society should work. If you disagree, talk to one another." 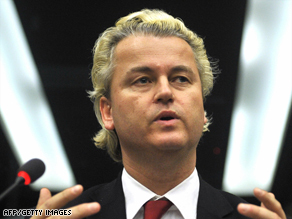 Wilders is a member of the Dutch parliament for the right-wing Party for Freedom. He released "Fitna" online in March 2008 to immediate controversy. The 15-minute film features disturbing images of terrorist acts superimposed over verses from Islam's holy book, the Quran, to paint Islam as a threat to Western society. Caroline Cox, a member of Britain's House of Lords who is not affiliated with a political party, invited Wilders to screen his film at a private session in parliament. She told CNN that she wanted lawmakers to see the film to provoke discussion. "We're showing it on the basis of freedom of speech," said Cox, who has been a free speech advocate throughout her career. "It's a serious showing, with serious concerns and serious consideration." Cox said she disagreed with the government's decision to bar Wilders, who was also scheduled to discuss the film. "I think it's appalling," she told CNN. "(For) the British government to prevent a European parliamentarian coming to speak to parliamentarians over here is very disturbing. I think it will be ready by many people as a sign of appeasement to threat and intimidation." After its release, the movie drew complaints from the European Union and the Organization of the Islamic Conference, as well as concern from the United States, which warned it could spark riots. Dutch authorities filed charges against Wilders last month, accusing him of inciting racial hatred in speeches and in the film. "Fitna" opens with a controversial caricature of the Prophet Mohammed wearing a turban shaped like a bomb, followed by translated portions of the Quran. The passages are interspersed with graphic images of the September 11, 2001, terrorist attacks against the United States, juxtaposed with audio from 911 calls made by the victims trapped inside the World Trade Center in New York. In his interview with the BBC, Wilders said he does not hate Muslims but opposes the "Islamization" of the European continent. Five years ago, Dutch director Theo van Gogh was stabbed to death by a member of a radical Islamic group after his short film "Submission" used verses from the Quran written on women's bodies to criticize the treatment of women in Islamic cultures.